With 30 Years of experience in the manufacture of lathes. 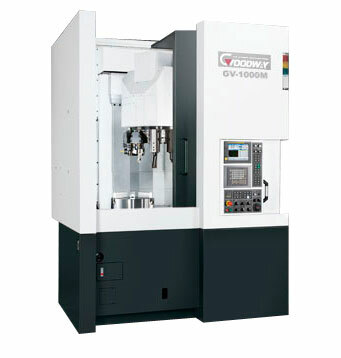 Goodway is pleased to introduce our GV-1000 CNC Vertical Turning Center, which combined ultra high power performance, super rigid construction and high speed machining. The GV-1000 provides turning and milling capacity for the dynamic demands of todays market and onward into the future. With a maximum turning diameter of 1,000 mm ( 39.37" ) by 760 mm ( 29.92" ) long, the GV-1000 is ideal for the machining of large parts and heavy cutting conditions. The ‘C’ Axis and a live tooling turret enable “ One Hit Manufacturing” of suitable components. Full surrounded guarding for a clean environment. The use of slide-way covers protect all the bed-ways. Environmentally friendly lube system provides the lubrication for the slide-ways and ball-screws. Machine Design is based on Ergonomics, all so known as Human Factor Engineering is the science of refining the design of products to optimise machine for human use. This principle has been fully integrated into the design, from the ease of operation to the compact floor space, which gives a floor space saving of up to 50% over a conventional turning center design.